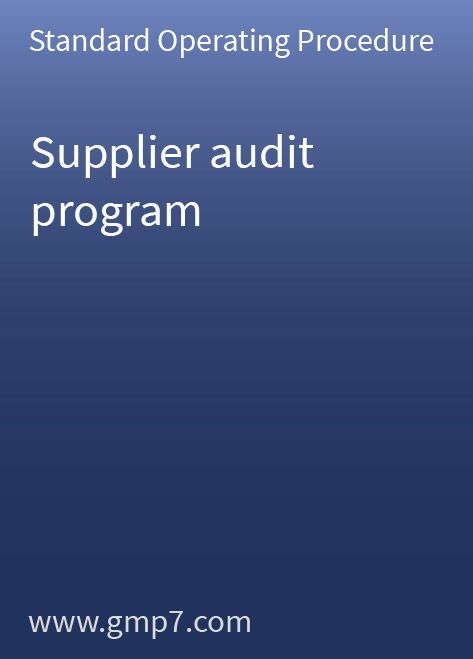 Regular supplier audits must be performed to assess the effectiveness of suppliers’ quality assurance systems and to ensure that suppliers meet the requirements of cGMP. The comprehensive testing of pharmaceutical goods is no substitute for an efficient site supplier audit program. This Standard Operating Procedure (SOP) deals with suppliers involved in activities such as contract manufacturing, packaging/labelling operations, analytical/microbiological laboratory testing, stability testing and general cGMP facilities. The 16-page Standard Operating Procedure (SOP) guides you step by step through the essential key processes of pre-audit activities, the audit itself and post-audit activities. It describes the responsibilities of the lead auditor, the audit team and the party subject to the audit and also includes a general audit scheme quoted directly from the “Food and Drug Administration Compliance Program Guidance Manual Program”. Attached to the Standard Operating Procedure (SOP) is an audit report form reflecting all the details needed for a common industry audit report. This SOP template only needs a small amount of site-specific modification before it can be adopted for your operations.